Writer/director Alex Garland (“Ex Machina”) has a new science fiction movie in cinemas now that will probably not be a giant crowdpleaser/moneymaker, but it is also one of the most thought-provoking, intelligent and genuinely interesting movies I’ve seen since “Blade Runner 2049.” And it’s not a sequel or a prequel, nor is it based on a Marvel comic book (though it is based on a novel by Jeff VanderMeer). When people say they miss pre-Star Wars science fiction movies that were more thoughtful, and less about spectacle or space wars? “Annihilation” is exactly the kind of movie that they’re talking about. My biggest worry is that not enough people will ever see it. A meteor falls to Earth and crashes near a lighthouse on an unspecified beach somewhere in the United States. 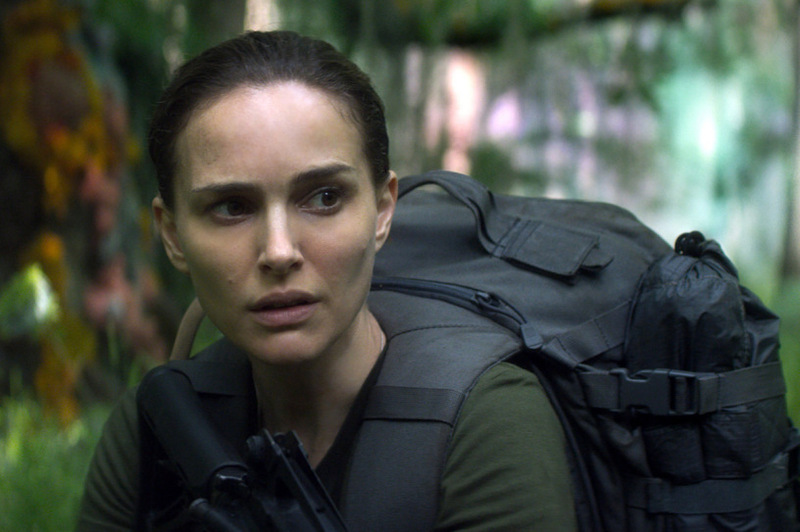 Natalie Portman plays ex-US Army officer turned biology professor Lena, and the film is told from her perspective, via a debriefing in a quarantine facility. Lena is near-catatonic as she struggles to recall exactly what happened to her during a period of missing time. She remembers her presumed-dead husband Kane (Garland favorite and fellow Star Wars veteran Oscar Isaac) returning home from a classified mission literally a ‘changed man.’ Kane is unable to speak of what happened to him during his missing year, and he seems to be dying of a mystery illness that is causing him to seize. Lena is taken away by mysterious government authorities who seem intent on quarantining her and the ailing Kane. Later on at the facility, she is allowed a little more freedom by a mysterious psychiatrist named Dr. Ventress (Jennifer Jason Leigh, in an unsettling performance) and decides to anonymously mingle with several other women there; a somewhat passive molecular biologist named Josie (Tessa Thompson, “Dear White People” “Creed”), tough soldier Anya (Gina Rodriguez), and anthropologist Cass (Tuva Novotny). All of the women (led by Dr. Ventress) pool their various fields of expertise and prepare to investigate a nearby zone called “The Shimmer.” Other groups (including one with Lena’s husband Kane) have tried to investigate this slowly expanding, iridescent region and have failed to return… save for Kane. Once inside the Shimmer, the group’s sense of time is somewhat askew. The women awaken from their tents after what they assume to be their first night only to discover several days of rations are gone, indicating they’ve been there for awhile. They also discover that communications don’t work and that radio waves seem to scramble. Geography is also difficult to make out because of the Shimmer’s iridescent, light-bending qualities. Once inside, Josie is attacked by what appears to be a giant, albino alligator. The creature is killed by the group’s automatic weapons fire, and Josie is saved, but studies of the gator reveal mutated, sharklike teeth. The creature is some kind of impossible, cross-bred mutant. Finding temporary shelter in a deserted military base, the group discovers that previous expeditions into the Shimmer also used the facility as well. In a gruesome, David Cronenberg-worthy scene, they find remains of dead soldiers splattered and scrambled along the walls of an abandoned swimming pool. They also find video recordings of Kane (whom most of the group don’t yet realize is Lena’s husband) slitting open a living soldier, only to discover the soldier’s intestines have become large slithering serpentine creatures, living within his torso. Later that night, as Lena comes to relieve Dr. Ventress on watch duty, Cass is dragged off by some kind of freakishly large bear-creature near the fence. 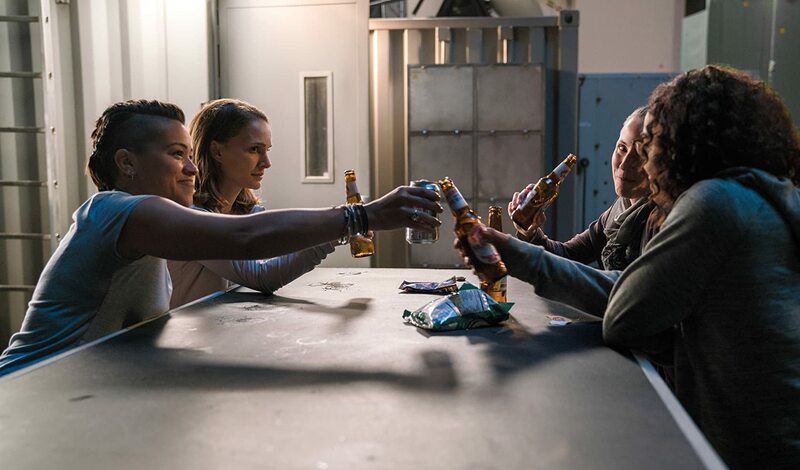 Cass’ dead body is discovered by Lena the following day, as the group moves on toward their ultimate destination; the lighthouse where the initial meteor impacted and created the Shimmer. Stopping along an abandoned home for temporary shelter, the team finds a field of trees that seem to mimic human forms. It begins to dawn on Josie and Lena exactly what is happening; the Shimmer doesn’t just distort radio waves and light… it also scrambles and mixes DNA as well. The effect is already happening within them, as Lena discovers from her own blood samples under a microscope. An increasingly paranoid Anya then discovers that Lena’s relation to Kane (who was seen earlier in the video), and in a scene right out of John Carpenter’s “The Thing,” Anya overpowers the group and ties the remaining women to chairs. A scream is heard from what sounds like the dead Cass. Anya assumes that Lena lied about finding her body earlier, until the source of the scream is revealed to be the bear-like mutation that killed Cass. In a scene that is one of the most disturbing I’ve seen in a modern horror film, the bear-creature has somehow absorbed the final thoughts from Cass’ mind as it killed her; and its own cries have now become her blood-curdling final screams. This is serious nightmare fuel, folks. Anya is killed by the creature, as the remaining women struggle and eventually free themselves. The next day, Josie begins to sprout vines from her arms, and she realizes she no longer wants to actively resist what is happening to her. She becomes another of the human analog trees. A pattern begins to emerge; those who show aggression are met with violent ends. Those who don’t resist are gently assimilated into new organisms. As Ventress (who is revealed to be dying of cancer) goes missing, Lena presses on alone towards the location of the lighthouse; the meteoric source of the Shimmer. Once inside of the lighthouse, Lena finds a video of her ‘real’ husband’s final moments as he takes his own life with a grenade. Lena then sees a strange, rabbit hole-like formation on the floor of the mutating lighthouse. She then wanders down the hole, and finds the dying Ventress; who then erupts into a shimmer of energy into into a mysterious amorphous being. The being absorbs blood from a cut on Lena’s face and begins to mimic both her form and actions. She attacks it, it repels her attack. She paces it, it paces her. She lies down, it lays beside her. Lena gives the creature a live phosphorus grenade (of the type Kane used to kill himself) and runs, as the creature and the lighthouse are destroyed. The Shimmer is seemingly neutralized. Concluding her debriefing, Lena comes to realize that the creature’s intent wasn’t hostile; that it only reacted to hostility by mimicry, not through any conscious will. She’s not sure if the alien was trying to communicate or if it was even aware of her presence. In quarantine, she is reunited with the doppelgänger of her dead spouse. She asks if he is Kane, to which he replies, “I don’t think so.” The two then embrace… and their pupils mutually shimmer. We are left to assume that both Kane and Lena are doppelgängers. There are so many levels to this movie that my own analysis will be frighteningly inadequate, I’m afraid. The best I can do with this post is to examine my own impressions of the film, rather than its deeper philosophical underpinnings. There are simply too many potential subjective interpretations awaiting any viewer who sees it. “Annihilation” will be many things to many people. As an online friend remarked, there is a lot to unpack. 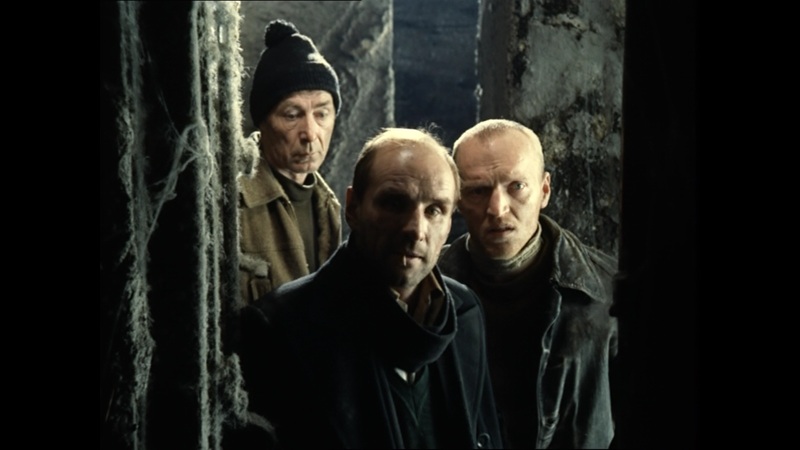 “Annihilation”’s Russian cousin: Andrei Tarkovsky’s “Stalker” (1979) involved a trio of men making their way through a formidable, shifting ‘zone’ toward an uncertain destination. Stylistically, the movie seems to be a loving homage to the works of Soviet-era Russian filmmaker Andrei Tartovsky. Specifically, Tarkovsky’s “Stalker” (1979) and “Solaris” (1972). “Stalker” also had a mysterious, reality-bending ‘zone’ on Earth (that may have had an alien origin as well). The zone in “Stalker” was similarly quarantined and equally treacherous, as it changes geography on a whim. A guide offers two men passage into the zone toward a mysterious ‘room’ rumored to be at its center. The room is said to have the power to reify any wish. The Shimmer of “Annihilation” is very similar to the ever-changing zone of “Stalker”; so much so, that I’d almost call “Annihilation” a quasi-remake. The amorphous, alien mimic seen at the climax also reminded me very much of the ‘sentient ocean’ of the alien planet “Solaris.” The alien ocean had the power to deliver ‘visitors’; copies of people (living or dead) based on the subconscious desires of the occupants of an orbiting space station. “Annihilation”’s mimetic beings, such as Kane, and possibly even Lena, are very similar to the ‘visitors’ of “Solaris.” Both seem to feed off the memories/personalities of those subjects whose minds they probe, and act accordingly. In both films, negative emotions and hostility are returned in kind. Similarly, benevolence and passivity are returned either with love or assimilation. 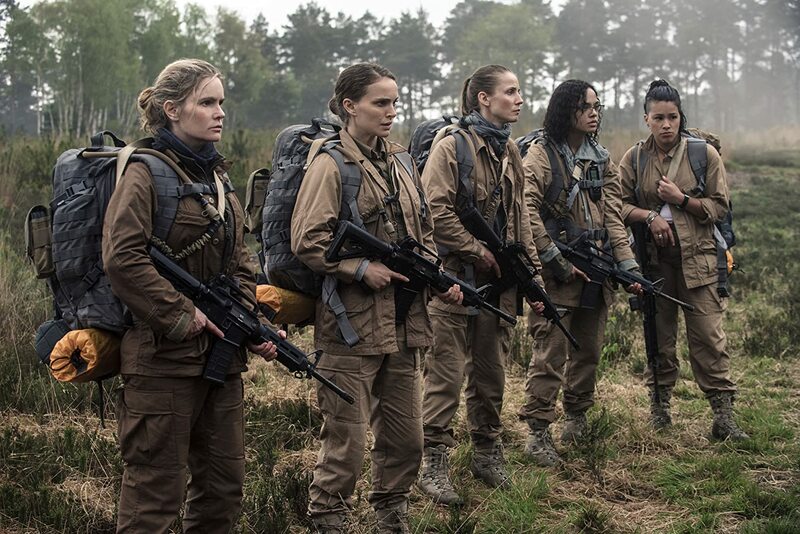 While “Annihilation” is similar in structure and feel to Tarkovsky’s science fiction films it is somewhat more accessible, though no less intelligent or thought-provoking. * … with a generous helping of John Carpenter’s “The Thing” thrown in. 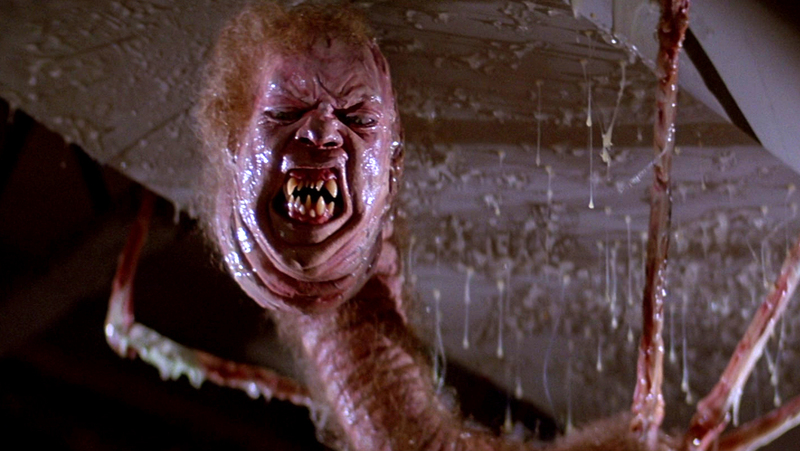 Anyone who’s seen “The Thing” (the 1982 version; vastly superior to the 1951 original) will also recognize homages in “Annihilation.” In “The Thing”, another single gendered group (all male, as opposed to the all-female group of “Annihilation”) encounters a creature capable of assimilating other forms and even combining forms (the creepy-as-hell spider-like creature with the human head, for example). The scene of Anya tying the remaining group to chairs was a deliberate nod to “The Thing”’s blood test scene, where Kurt Russell’s “Macready” has his own men tied to chairs as well. The shark-toothed gator, the blob of human parts plastered onto the abandoned pool, and more specifically, the human death-crying bear-creature (with traces of a human skull grafted onto its face) also had properties of the shape-changing “Thing” as well. Since “The Thing” was based on John W. Campbell Jr.’s short story “Who Goes There?” it’s safe to say that “Annihilation” is a nod to Campbell’s story as well. “Annihilation” homages Carpenter, but never feels like a ripoff. “Annihilation” has its own story to tell, but it’s not a horror story (despite what some of the trailers seemed to imply). The borrowed elements go toward a fresh new mix. * The core group of characters/actors. The core cast of “Annihilation” is all-female, and it doesn’t feel like a deliberate “Ghostbusters”-style statement, either. The female characters (and cast) just happen to be the most qualified personnel available, and that’s really all there is to it. Previous expeditions into the Shimmer were all-male, with the doppelgänger of Kane being the sole ‘survivor.’ That the latest group is all-female feels no more surprising than the three crewmen of Ron Howard’s “Apollo 13” being all-male. The roles are cast with remarkable actors as well. Jennifer Jason Leigh (Dr. Ventress) delivers a more restrained version of her “Hateful Eight” creepiness. Tess Thompson (Josie) plays a more docile and passive character than her fiery “Dear White People” and “Creed” roles; that’s she’s up for it is a tribute to Thompson’s flexibility. Gina Rodriguez ably handles Anya’s physicality, panic and paranoia. Tuva Novotny’s Cass definitely leaves an impression. This ensemble is led by the film’s star Natalie Portman, and to be honest, she was a concern of mine before I saw the film. Portman is a brilliant technical actress. However she seems to approach her roles more intellectually; lacking the heart, earthiness or spontaneity of other contemporary A-list actresses, such as Jennifer Lawrence or Emma Stone. I recently saw Portman in “Jackie” (2016), and her performance was well modulated but never quite convincing; the gestures, movements and accent were all right, but her performance just seemed a bit too careful. I could say the same of her role in “Black Swan” (2010) as well. Oddly enough, Portman was far more vibrant and emotionally charged in “Leon: The Professional” (1994), a role she owned when she was all of 12 years old. While Portman’s character of Lena is an academic (as well as a former soldier), there are moments where I felt the emotions and not just the calculated processes of acting. With “Annihilation,” her performance that had some of her usual precision, but also occasional infusions of power, eeriness and raw emotion as well. I now believe Natalie Portman was ideally cast in this film. 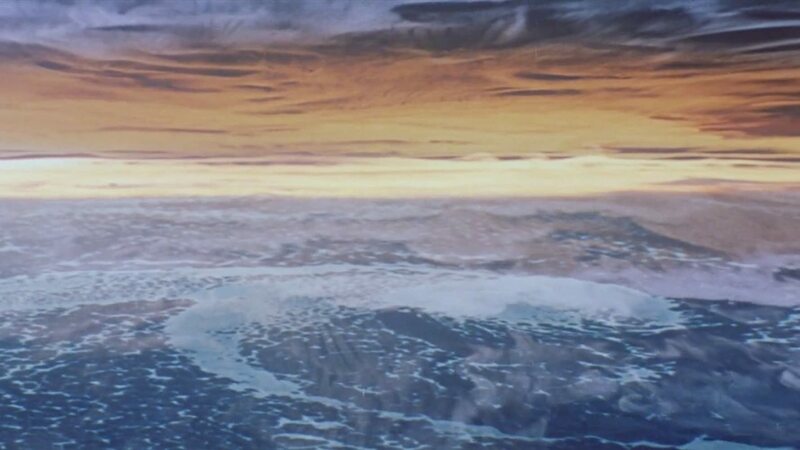 The music is co-credited to Geoff Barrow and Ben Salisbury, but one of the strongest influences seems to be from late Hungarian composer Gyorgy Ligeti, most famous for his “Requiem” (most famously used as the ‘monolith theme’ from 1968’s “2001: A Space Odyssey”). Some of the discordant and deliberately unsettling noises on the soundtrack were reminiscent of the alien ’voices’ heard near the end of “2001,” when astronaut Dave Bowman finds himself in an alien representation of a human hotel room. While the soundtrack, seemingly a bit derivative in spots, is appropriate and very fitting. The visual effects, as well as the makeup prosthetics of “Annihilation” are creative, very beautiful, deeply disturbing and memorable. This is somewhat ironic for a movie so specifically in line with pre-Star Wars, spectacle-light science fiction movies of the early 1970s; the sort of science fiction movies that didn’t rely too heavily on spectacle and were usually more about high-concept ideas. In this way, “Annihilation” is the best of both worlds. The iridescent Shimmer itself looks both otherworldly and yet not too fantastic to be out of place in our own world somehow. The vine-like growth over everything within the Shimmer adds to this natural yet surreal look. A common mistake made in superhero or space opera movies is that they often have so many unnatural looking elements (energy blobs, huge spaceships, etc) that they don’t tend to look relatable. None of the CGI visuals or makeups in “Annihilation” really have this problem; they all have an organic ‘funk’ to them that adds to their tactile reality. The end credits feature artwork representing the DNA dance that occurs within the Shimmer that is reminiscent of 1960s-paisley art fused with images from an electron microscope. Mesmerizing. 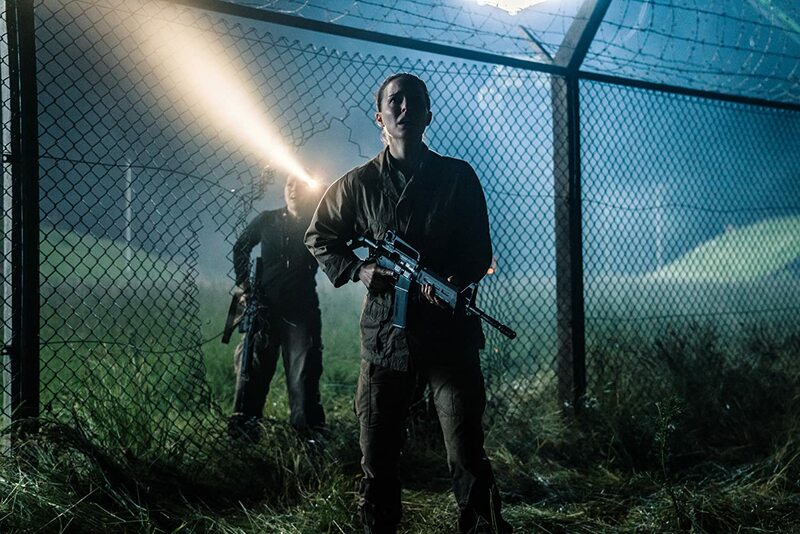 While many of the elements in “Annihilation” are familiar to fans of older science fiction movies (“Stalker,” “Solaris,” “The Thing,” “2001”), they are recombined to create an all-new, authentic science fiction film. That the core cast of characters are all female just feels like coincidence, and doesn’t deliberately call undue attention to itself (though it makes an even bolder feminist statement than the more popular “Wonder Woman”). HollywoodReporter.com/How a clash between producers led to a Netflix deal. It’s unfortunate that “Annihilation”’s release seemed to lacked studio confidence, because it is precisely the sort of science fiction movie we need in cinemas now more than ever; a time where it seems that almost every new movie involves superheroes, spaceship wars, or a comic book source. Nothing against those movies (they’re a lot of fun sometimes), but occasionally I miss a genuinely thought-provoking and yes, even disturbing piece of science fiction cinema.